I have recently been inspired by the Facebook postings I have read from Shaun Wackerly,who lost a precious little baby boy, and Patti Whigham who is going through a kidney transplant. I hope this article inspires us all to trust God in our difficult days. How do you respond to troubles and trials in your life? We were never promised that this life would always be smooth. It has been said that if things are going good for a person, he has just come out of trial or is soon headed for one. When we have difficulties in our life we would do well to follow the path of Shadrach, Mesach, and Abednego, and trust God in the Flames. Dan. 3:25 He answered and said, Lo, I see four men loose, walking in the midst of the fire, and they have no hurt; and the form of the fourth is like the Son of God. The word faith signifies the ability to trust in the infinite one; a lifestyle that places supreme confidence in a Supreme Being. When we think of faith names like Noah, Enoch, Rahab, David and Abraham come to mind. We think about God working the miraculous through the ordinary. We are able to gain strength by recalling the names of these faithful people. The picture we draw of faith is inspiring. Faith is described as strong, bold, unswerving, and enduring. That is true when speaking of God’s faithfulness, but it is not always true when speaking of man. Man’s faith is imperfect. Sometimes we doubt and question. Most of the time, we do not understand God’s ways. Having faith in smooth times is simple, but what do we do when we are in the flames? What do we do when it appears God is not going to deliver? Shadrach, Meshach, and Abednego knew about trying times. They literally felt the heat associated with being faithful. These 3 men teach us how faith responds in difficult times. King Nebuchadnezzar gave a mandate for all to worship the golden image he made. Those who refused would be thrown into the furnace. Nice of him to give them a choice wasn’t it. Our 3 heroes refused to bow down. Upon learning of their disobedience the king gave them another chance. They did not have much of a choice; bow or burn. Sometimes life seems unfair. Death invades as an unwelcome guest. Painful words from another tear us apart. Families divide, suffering from the strain of uncaring attitudes, we look around and we wonder where God is? Where is he, when our world is falling apart? Some people live under the mistaken idea that once a person obeys God that problems will disappear. We know that God gives us his power grace and wisdom to deal with troubles; but the scriptures never make any promises that we can avoid or escape trouble. The Bible warns us that the believer may face even greater difficulties in certain areas than he had before his baptism into Christ. Shadrach, Meshach, and Abednego would have had no problem bowing had they not been children of God. It has often been said that a person really doesn’t know who his friends are until the bottom drops out. To a certain extent we may never come to know the true love of God and Jesus until they have carried us through some trouble or trial. When they bring us through some distress our faith in them increases. Sometimes in life events do not always work out the way we want them to. When this happens some are quick to doubt and say that Jesus was not there in their hour of need. Some become angry and turn away and they write God and Jesus off as being unfaithful. When things get bad in our lives we would do well to follow the philosophy of the three Hebrew children, Shadrach, Meshach, and Abednego. First, they said “if we are thrown into the flames the God we serve is able to save us from your hand, O, King.” God and Jesus are able. Regardless of the problem they can come to the rescue. No matter how chaotic life becomes they are able to deliver. Second, these 3 Hebrew children display their level of faith. In Dan.3:18, they tell the king, “even if He doesn’t deliver us we will not bow.” What faith these young men had. They had just told the king that “God is able” to deliver and now they say even if He doesn’t we will not bow. That’s important because we have never been promised a lack of suffering and pain. Painful circumstances may not change. We may want them to change, but they may not. We have been promised that we will have what we need to survived. Long ago Nebuchadnezzar looked down into that fiery furnace and in astonishment said, “Did we not cast three men into the fire? Behold, I see four, and one is like unto the Son of God.” Trust in God means help is on its way. We need not expect God and Jesus to keep us from distress. They want to sustain us through it. They want to make our load lighter. 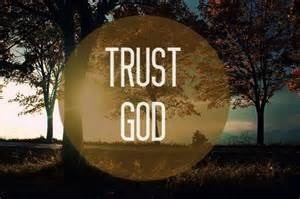 The pains and distresses of life will be much more bearable when we reach the point of trusting God in the flames. Have you ever let your anger get the best of you? Have you ever wanted to retaliate against someone who wronged you? These are things that sometimes confront many of us. In this article Colby Culbertson discusses the idea of dealing with anger. ​The carnal, human side of a person advises us as Christians to use retaliation as a means of getting even when we are wronged. This writer will be the first one to confess to struggling a great deal with this. Yet, the New Testament clearly points out that for a Christian to allow his/her anger to control oneself is sinful and therefore putting a Christian a guilty distance from the Lord. The apostle Paul instructs the brethren at Rome very plainly in Romans 12:19—Dearly beloved, avenge not yourselves, but rather give place unto wrath: for it is written, Vengeance is mine; I will repay, saith the Lord. It is not sinful to be angry about things that happen to us when we are wronged. It is wrong, however, when we allow that anger to turn into a grudge that we hold (James 5:9), or worse, we seek revenge on whosoever it is who does us wrong. That’s what Paul explains here. I’m going to use myself as an example, because I believe I struggle with this just as much as anyone. Suppose someone comes along and does me the wrong way or does something to me that makes me mad; immediately my carnal side tells me to let them know quickly, what a mistake they just made in doing me wrong! But I can’t do that and still be right in God’s eyes. I’m no better in the Lord’s eyes if I return evil for evil. Two wrongs don’t make a right. We are not at liberty to issue justice to those who have done us wrong out of vengeance because vengeance DOES NOT BELONG to us! It belongs to the Lord, and he will give all those in sin their just reward when this earth stands still. Paul has a bit more to say on the subject to the congregation at Ephesus in Ephesians 4:26-27—Be ye angry, and sin not: let not the sun go down upon your wrath: Neither give place to the devil. Believe it or not, Paul tells these people that you can be angry and refrain from sinning! This is possible if we only learn how to deal with anger. We have to control anger that we have, rather than letting it control us and eventually getting out of hand. Pay close attention to verse 27. Did you know that every time we retaliate, hold a grudge, or seek any means of revenge, we are giving place to the devil? When that happens, we are allowing the devil to corrupt us by making our anger and wrath impossible to contain! This is why it is so very important for the Christian today to master the art of temperance as the scriptures refer to it, or self-control. Friends, the smallest spark can start the largest fires, and so it is with our anger. Believe me, I know how hard it is. If you are a Christian, you must learn how to deal with anger in the proper way. The way a Christian is taught to do so in the scriptures. When you hear someone say, “that’s relative”, what they are really saying is; “I prefer to do something else or do it in a different manner.” They are saying that absolutes do not exist. In this article Aaron Battey writes about the idea of “relativism” and shows us it is a dangerous idea. ​It is hard to walk the earth and pass away before hearing someone say at least once, “That’s just relative.” Some people believe that everything is relative to any given person or situation. Consider the enraging idea that there is only one church going to heaven. Is this a true statement? The modern and popular “Christian” would say that this is a relative statement, or “What’s right for you is not what’s right for me.” The Bible says differently. ​The proper term to describe the philosophy above is “postmodernism” or “relativism”. The Bible does indeed address this subject. Judges 21:25 says, “In those days there was no king in Israel; everyone did what was right in his own eyes.” The period of the judges was a 450 year span of anarchic chaos and immorality. Why were times so bad then? Because what was right for one person was not right for the other person, or as Judges says, “everyone did what was right in his own eyes.” This type of thinking evolved long before Judges though. The first relativist was Adam’s son Cain in Genesis 4. He decided it didn’t matter what kind of sacrifice he gave to God. Carrots were okay in the eyes of Cain, but God did not approve. You can then read to find out that Cain’s lineage produced only evil (Genesis 4:16-24). ​Relativism is wrong. It is not only wrong, but the doctrine is dangerous. Relativism is so dangerous that it can unwittingly lead to losing one’s soul as Cain lost his. This short article is just a short piece to introduce you to this evil philosophy which creeps around inside and outside the Lord’s church. Next time we will discover in more depth why this doctrine is a contradiction by using simple logic and more enlightening scriptures. You can know the truth, and “The truth shall make you free,” (John 8:32).